These are some more of my roses that I never got round to posting earlier in the summer. I want to keep a record of all my roses which I hope to compile in the winter months. 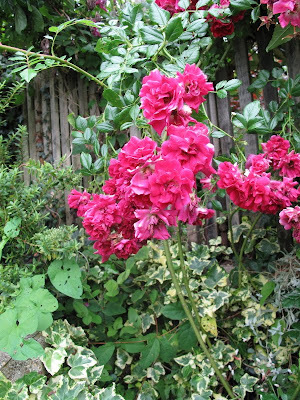 The above is Blush Rambler very vigorous and flowers profusely. This is a cutting of Francine Austin I have pruned back most years to try and encourage more growth but I think this year I will be more gentle with the pruning. 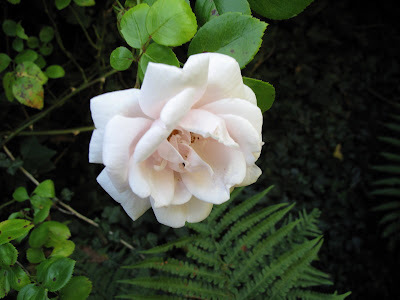 I never seem to have vigorous white flowering roses all mine struggle. 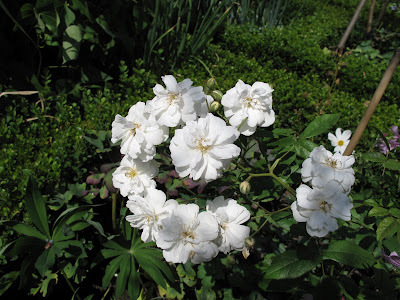 Well actually not all this is Rosa Moschata which is very vigorous and flowers quite well. 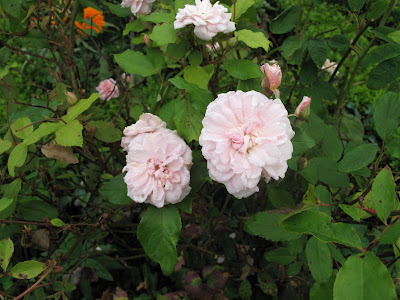 David Austin catalogue says 'This the Old Musk Rose probably introduced in the time of Queen Elizabeth I. It bears it's glistening creamy white single flowers in widely-branching sprays. Late-blooming and then repeat flowering, a delicious Musk fragrance.' How true. This was a cutting from New Dawn climber, it grows facing North and hardly gets a glimmer of sun but still flowers and brightens an otherwise dull wall/fence/hedge. This was a cutting from Julie a neighbour and I think it is Crimson Shower. See the problems I have with bindweed ugh! It's everywhere. White Flower Carpet which is struggling although it was swamped by lavender which has been pruned hard back to allow the rose more light. 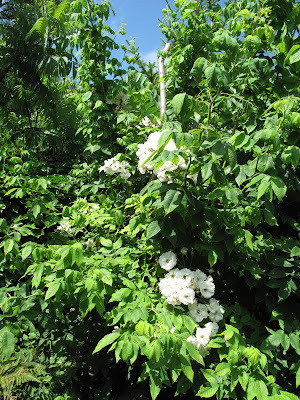 The above is yet another bush of Cecille Brunner taken from a cutting from another neighbour Christina's rose. The roses are quite tiny really but flowers continuously through the summer. This is Hermosa I moved it to the front of a bed because it was so short and frail and what happened, it liked it so much it is growing very tall infact too tall for the position I chose He ho! Jayne Austin, yes one I have shown before but still flowering happily until quite recently. This rose is Flower Carpet grown from a cutting by Jane who I worked with some years ago. This I will have to call Nanny's rose as I have no name for it. it was a cutting taken by my sister in law from Mike's mum's rose. It is a shrub and it's flowers are similar to Crimson Shower perhaps slightly bigger but grown in sprays and repeat flowering. The Jayne Austin and the Rosemoor are so pretty and full. All of your roses are gorgeous. Have a good day. Lovely Roses, Joanne. When were these pictures taken? By September/October my roses look dreadful but they keep flowering so I am training myself not to look at the bare stems! Yours look lovely and healthy, I love David Austin roses too. One year we visited his gardens and nursery, as you can imagine it was inspiring. I have never taken rose cuttings, I really must try sometime. Sylvia some were taken in August some in September but there are still some roses flowering at present in the garden clearly not quite like May/June it was just I never got round to posting them earlier and wanted a record of all the roses. Beautiful roses! I wish I could smell them all. Thank you. I love roses! Wow, these are absolutely beautiful...I can smell their fragrance in my senses....thanks for sharing them with us...so we can enjoy their beauty too. Tina and Liz It is a pity computers can't transmit perfume but our imagination is quite clever. Jo and Renee I am glad you enjoyed the roses I hope you are both feeling a bit better. You might be interested in the link( top right column) I added today an article published in the Journal of the Association of American Physicians and Surgeons rather lengthy but much food for thought. Joanne, I can't believe that you have grown most of these from cuttings. Is it difficult? There is so many beautiful roses, I would be hard pressed to pick my favourite. 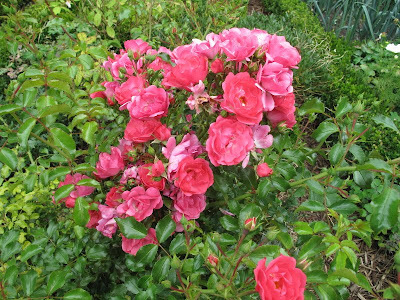 It just so happens that of this post a lot were from cuttings although most of my roses came from David Ausin's. However I have taken successful cuttings from all my climbers and ramblers and even managed one from Cottage rose so perhaps may try some of the other DA roses again one day. Such pretty roses! I am impressed you grew so many from cuttings. Maybe someday you could share some tips with us(please). You have so many pretty roses! Don't you just love when you move a small plant that ends up loving it's new spot so much it outgrows it! Rosemoor and Jayne Austin are beautiful, I love all the petals. So lovely to see the roses and sunshine!! I am constantly amazed at how many roses you have in your garden and how you remember their names and history. I can hardly wait till some one figures out how to add real scents to pictures so we can tantalise all our senses!! What beautiful roses. 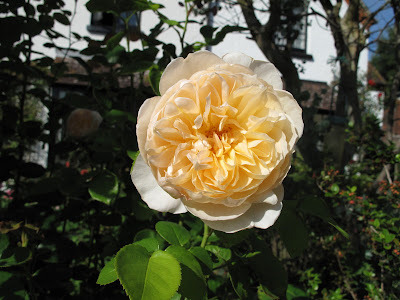 I have grown some David Austin roses and love their fragrance and old-fashioned appearance. Thank you so much for sharing. Love the Jayne Austin. I wish I could grow such beautiful roses as you do. I have practically given up on them. But I so enjoy looking at yours. Thank you everone for your lovely comments. Carolyn I grow my rose cuttings in tall pots ones I have bought clematis in. I take a length about 12 inches from the middle of a branch so throw away the whipey bit on the end. I use slightly gritty soil/compost and put about 4 cuttings in each pot with leaves on at the top but not too many. I do this late July and onwards for some weeks. Obviuosly they are best left with some shade from the heat and sun and where you can remember to water so they don't dry out. Some you loose and some you win. Best to try some of the Ramblers first as they are the easiest to stike. The following early summer I transfer to individual pots and then leave probably another year before they are strong enough to fight for survival in my neglected garden. The more you do the more success you have and the less the failures matter. I love your roses, Joanne! 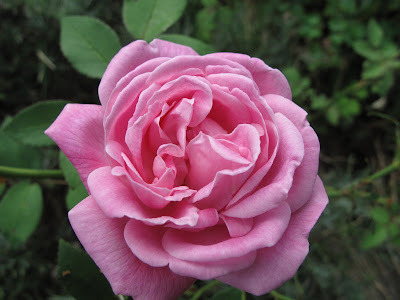 I just bought a pink carpet rose. I remember some garden guru told us that an original carpet rose was a yellow one, so others, not yellow, could lack some qualities. What do you think? Joanne your roses are a treat! 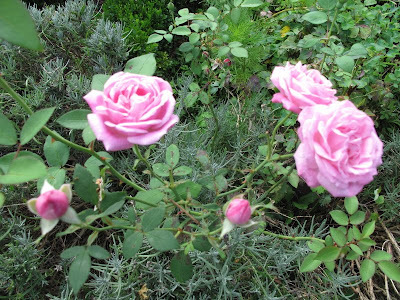 Hi Joanne, thanks for sharing your roses with us, they are wonderful and a sight to make one bubble over with joy. 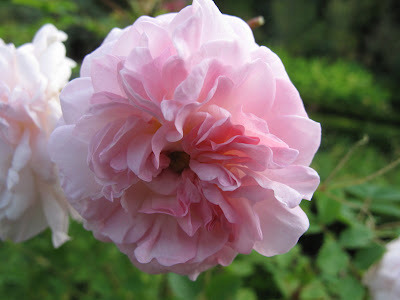 I am in the market for a small climber and prefer the old or antique own root roses. Any suggestions? I don't have any true yellow roses the nearest is Goldfinch a rambler but the carpet roses mainly grow quite vigorously Flower carpet can end up growing into quite a shrub although I prune mine every year. I grew it near a path and have to stake it up rather than trail as it grows so big. Frances now there's a challenging question. 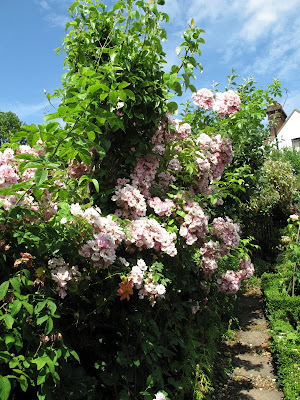 I tend to grow Ramblers rather than climbers in fact I only have Albertine 20'and New Dawn 10'climbers which are both lovely. 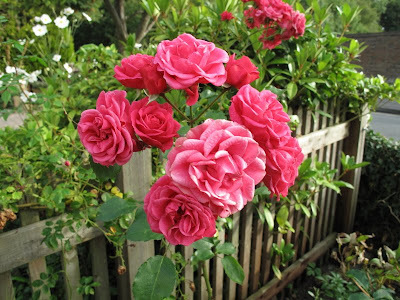 I think mast roses are grafted even though many will grow on their own root stock. As will both these climbers successfuly. I think if I were buying more I would be looking for repeat flowering ones. For small climbers say 6' I would even consider some of the Hybrid Musks Cornelia or Felecia. I have taken cuttings successfuly from Cornelia and grow them on tripods about 5/6', I saw them growing at Wisley on metal trellis either side of paths and realised they did not need to be left to grow as a large shrub with the necessary space to flop about. Just checked DA catalogue and it actually says they can be grown as small climbers. Mine have flowered and flowered. I look forward to hearing what wins your favour. 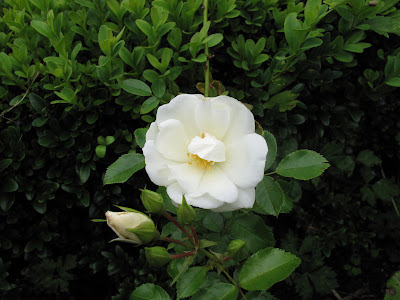 Carol Thank you so much for visiting my blog and glad you enjoyed the roses. I have just popped over to look at your lovely blog and your photos are amazing so I will be back for more views. I am so pleased you were aware and caught your Lyme early. I am hopeing the news this week about XMRV (virus) and the connection with ME will also help further lyme as many ME sufferers are found to have lyme and many Lyme patients find some of their symptoms respond to anti virals. Perhaps this new virus which was previously thought only to infect animals may well prove to be yet another of the co infections. Hi Dee Nice of you to pop by. Blotanical has been such a great place for meeting so many lovely people and blogs.